First Amendment Rights / Writes! 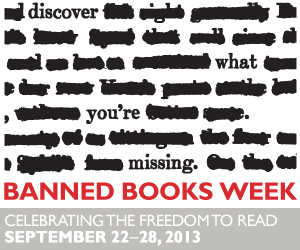 Banned Book Week. “What if you had no right to read” should be foremost in Americans minds in the fight for our First Amendment rights. This week is Banned Book Week The ALA, American Library Association, and this topic brought to my attention by The Librarian Who Doesn’t Say “Shhh”. Disappointment and incredulity prevails when witnessing how U.S. First Amendment rights are continually trampled and disdained. I read Harper Lee, John Steinbeck, George Orwell and William Golding as a child. Aside from the beauty of the literature, I broadened my horizons and knowledge. That these and other books have been banned or are banned at a minimum makes me sad. I saw the movie and then read the book Farenheit 451 as a child too. The impact of Ray Bradbury’s work was not lost on me. The descriptor “What if you had no right to read” should be foremost in Americans minds in the fight for our First Amendment rights. In 7th grade our civics teacher took us on a field trip to see The Lord of the Flies and Soylent Green, apparently I was a fortunate student. Take a look at these classics that have been banned. Look further for books banned in the past year, I have only cited from the ALA 3 – more than enough to make my point. Disappointment and incredulity prevails when witnessing how U.S. First Amendment rights are continually trampled and disdained. Totally Joe Atheneum Books for Young Readers by James Howe. Marked for removal in the Davis, Utah School District (2012) because parents might find it objectionable. The title character, a thirteen-year-old boy, writes an alphabiography—his life from A to Z—and explores issues of friendship, family, school, and the challenges of being a gay teenager. Source: July 2012, p. 156. The Family Book from Little, Brown by Todd Parr. everything furnished by GLSEN (Gay, Lesbian and Straight Education Network), including learning materials and various programs aimed at preventing bullying. Source: July 2012, p. 157; Sept. 2012, pp. 202–3. 500 Years of Chicano History in Pictures from Southwest Community Resources by Elizabeth Martinez. The Dirty Cowboy Farrar Straus Giroux by AmyTimberlake. Removed from the Annville, Pa. elementary school library shelves (2012) because of its illustrations, involving a cartoon cowboy taking his annual bath. The supposedly true story is of a young cowboy who needs his annual bath and instructs his dog to watch his clothes while he bathes. When the cowboy emerges from his bath in the river, the dog does not recognize his familiar smell and refuses to give back his clothes. for the Center for Children’s Books. Source: July 2012, pp. 153–54. Again Cited from ALA http://www.ala.org/bbooks/bannedbooksweek/ideasandresources/freedownloads (Accessed September 22, 2013). For the complete list go here. Freedom of Speech is a Right Due All. There are books that have been written to which I have no plan of ever reading and will not recommend to others, but to ban them just seems wrong…I know it’s wrong. Thank you ! I think choosing not to read a book is a right, just as much as freedom of speech. I appreciate your comment Toi.